Pity the poor folk who think parsley is that junk massfood restaurants “adorn” your plate with (in the days of old, a parsley sprig on a diner’s plate was supposed to signify that the master chef had personally attended to that order—today it’s an uncomprehended habit). Fresh parsley of a good variety is a moderately strong flavoring, giving a good, clean freshness to many dishes; it is good enough to eat on its own (which makes it, by us, one of the great herbs); one of our favorite uses is garlic-parsley finger sandwiches (a huge platter of those will disappear mighty fast around here! ), or it can be the base and main ingredient in some wonderful green sauces. Indeed, at least two leading seedsmen list parsley on its own with the vegetables, not in the herb/spice pages. Parsley comes in many named varieties—though probably fewer than a review of seedmen’s catalogues might suggest, as the same types are probably called different things by different vendors. Parsley types broadly divide into two: flat-leaf (variously styled single, plain, Italian, Dark Green Plain Leaf, Catalogno, or Flat Leaf) and curly. Prevailing opinion is that the flat-leaf varieties have better and stronger flavor, though not all expert sources agree that there is a difference. The best for culinary purposes appear to be the so-called Italian (or sometimes “French”) or Plain-Leaf types, which are P. crispum var.neapolitanum (also seen as var. neapolitanum Danert, which we presume but can’t guarantee is the same thing). Our recomendation is to look for types designated Plain or Plain Italian Dark Green or something much like. Some seed houses distinguish Catalogna from “ordinary“ flat-leaf parsley; that may be their way of designating the neapolitanum type. There is also a now-obscure but apparently most praiseworthy variety of parsley known as Cilician parsley, popular in the Middle Ages and in the Middle East—it originated in Cilicia, once in Armenia, now in Turkey. It is said to have a “citrus after-taste”, and to be winter-hardy and easily grown. It is very difficult to locate supplies, but at least one U.S. seedsman (Adaptive Seeds) currently offers it. Parsley is a true biennial. If you like it anywhere near as much as we do, you dedicate a fair-sized patch of ground as a parsley bed, plant it densely, and let it re-seed itself annually, which it readily does in most climates. But if you are just keeping a few specimen plants, remember to have some of each year’s growth. In our climes, parsley should do well in full sun, though in warmer areas it appreciates a little shade in mid-summer. It is not fussy about soil, save for the usual herbal desire for excellent drainage, so as to avoid “wet feet”. Some say fertilize well, others say not too much; since we’re growing it for leaf, not seed, we’d say if you have to err with fertilization, let it be on the generous side. Parsley seed is notoriously hard to germinate, but much of that reputation is ill-deserved, and flows from a failure to recognize the need for “stratification” of the seed, which is the process of keeping the seed damp (as between sheets of damp paper towel) and cold (say refrigerator temperature) for some time (say a month or two) prior to planting, so as to replicate the seed’s natural habitats. (Periodically refresh the paper towels’ moistness.) Note: parsley seed does not store well: always use fresh, new-bought seed for parsley. If you are planting a good area, as we do, sow seed direct where it is to grow; pantywaists just growing a plant or two can start (and, for that matter, maintain) seedlings indoors. Parsley tolerates cool and damp conditions, so you can sow fairly early in the spring, though a hard frost on young seedlings is not A Good Thing, so don’t go crazy with earliness. Sow seeds shallow, about ⅛" down. Space plants at about 6 inches, or—if you’re planting a large area—broadcast it generously and later thin seedlings as necessary (making good culinary use of the thinnings!). 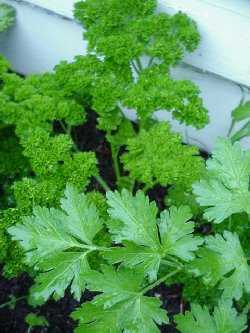 Frozen parsley will work in virtually all cooking applications, but the greedier among us will also grow some indoors during the winter to have a continuous supply for the occasional need for fresh parsley; it pots up quite nicely. Keep parsley well-watered at all stages of growth; do not ever let it really dry out. A light mulch, say grass clippings, helps hold moisture in the soil. A mild liquid fertilizer applied once or twice a season can’t hurt and might help, though we have found parsley, treated well otherwise, to be pretty hardy. When taking leaves for use (or freezing), snip stalks off close to the ground, starting with the outside ones (that practice best encourages new growth). As parsley is a biennial, be sure to generously seed it again in its second year, so you have plenty of plants in each year of the cycle; thereafter, it should self-sow satisfactorily. You loaded this page on Friday, 19 April 2019, at 16:17 EDT. It was last modified on Monday, 4 February 2019, at 16:33 EST.